Black Veil Brides frontman, alt-pop artist and raconteur extraordinaire Andy Biersack - more recently recognized by his solo moniker Andy Black - will be hosting The Journeys Alternative Press Music Awards on July 17, 2017 in Cleveland, Ohio. 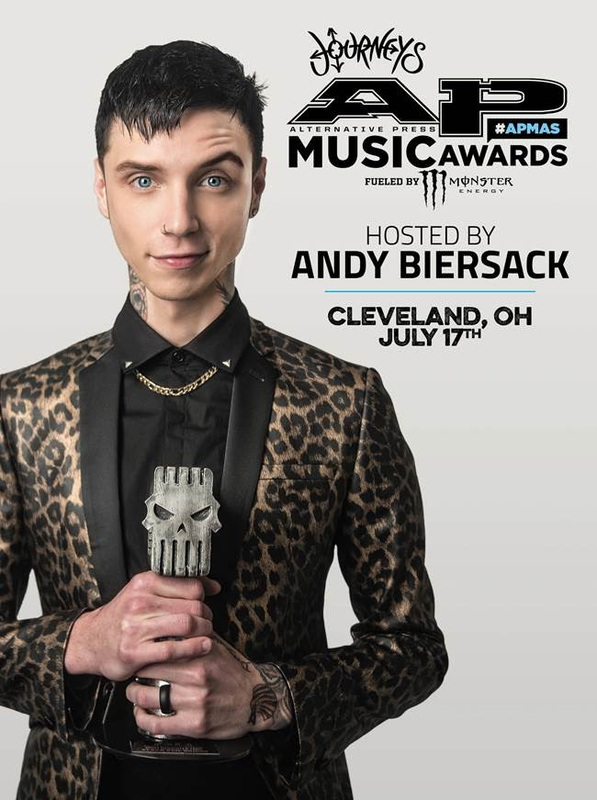 Black Veil Brides frontman, alt-pop artist and raconteur extraordinaire Andy Biersack – more recently recognized by his solo moniker Andy Black – will be hosting The Journeys Alternative Press Music Awards on July 17, 2017 in Cleveland, Ohio. Since bursting onto the national scene in 2010 as the frontman of Black Veil Brides, Biersack has rapidly risen to greatness-not only topping the music charts, but weaving his way into the hearts of fanatical followers worldwide. After reaching next-gen hard rock icon status with the release of four chart topping full-length albums, various other releases and singles with Black Veil Brides, Biersack ventured out on his own – starting his alt-pop solo project under the name Andy Black. His latest solo release, The Shadow Side, debuted on the charts worldwide. Cinematic in scope, ambitious in concept, yet down-to-earth in execution, The Shadow Side is as decidedly personal for Biersack as his work in Black Veil Brides is outspoken, taking a further step outward with its intimate confessional vibe and galvanizing populism. The APMAs promises even more of what fans have come to expect from the show- huge stars and incredible performances – presented on a scale worthy of the most exciting genres in music. Details regarding the 2017 APMAs venue, tickets and VIP packages, nominees, honorees, attending/performing artists, red carpet appearances, surrounding events and more will be announced soon via www.altpress.com/apmas.